The region above the Sun’s surface is the Corona, only normally visible during an eclipse. Coronagraph instruments use a baffle-plate to create an artificial eclipse and watch what is happening there. 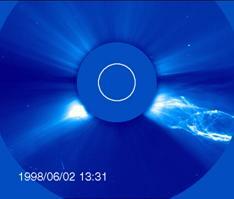 Temperatures in the Corona are much higher (millions of degrees) than on the surface (about 5800 degrees). It gets hotter as you move away from the surface, a strange effect not easily explainable. Eventually the build-up of energy in the magnetic loops may break-out in a solar flare releasing power equivalent to 100 million 1-megaton bombs (10^^25 J) in minutes. Bubbles of seething matter can burst in CMEs, coronal mass ejections, which shoot 1 billion tonnes of matter into space at 2000 km/sec. CMEs were not even dreamed-of until the 1970s when data from the OSO and SkyLab missions began to show up. Bright coronal mass ejection (CME) with an enormous erupting prominence as recorded by the LASCO C2 coronagraph onboard SOHO on 2 June 1998 at 13:31 UT. The SOHO EIT (Extreme Ultraviolet Imaging Telescope) images the solar atmosphere at several wavelengths, and therefore, shows solar material at different temperatures. In the images taken at 304 Angstroms the bright material is at 60,000 to 80,000 degrees Kelvin. In those taken at 171, at 1 million degrees. 195 Angstrom images correspond to about 1.5 million Kelvin. 284 Angstrom, to 2 million degrees. The hotter the temperature, the higher you look in the solar atmosphere. Pictures taken by the different instruments at different wavelengths reveal different features: sunspots; active regions; coronal holes; diffuse corona; bright points; flares; and CMEs. It is not always easy to find a correlation between different features—sunspots, flares and CMEs sometimes happen at different times and in different places. It would appear that they’re related similarly to earthquakes and volcanoes — same underlying cause but different characteristics. Sunspots are areas of the Sun’s surface which look darker because they’re made relatively cooler where magnetic loops restrict convection. ‘Relatively’ is used advisedly — the spots are at about 4,000 degrees (v 5,800 for the surface generally). The total number of sunspots and other features visible at any time varies in an 11-year cycle — really 22-years because the magnetic field reverses about every 11 years. The cycle happens because there is an energy build-up in the magnetic loops driven by differential rates of rotation at different latitudes of the Sun — regions nearer the Sun’s equator rotate faster. As the energy builds so there is more activity. Eventually something gives way, like an elastic band breaking, and activity winds down as the magnetic field settles again. 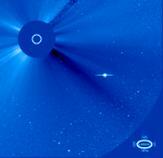 The Daily Mail used pictures like this LASCO shot (R) to claim evidence for flying saucers. In fact the ‘saucer’ is an over-exposed image of a planet or bright star where the over-loaded CCD is ‘bleeding’ into neighbouring cells. 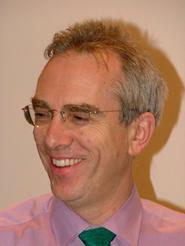 Professor Richard Harrison MBE is Head of Space Physics Division and Head of Solar Physics Group at the CCLRC Rutherford Appleton Laboratory. CCLRC is one of the largest government-funded laboratories in Europe. It provides world-class services and research and has been involved with 166 space missions including SOHO, Cassini/Huygens, Mars Express, and SMART-1.